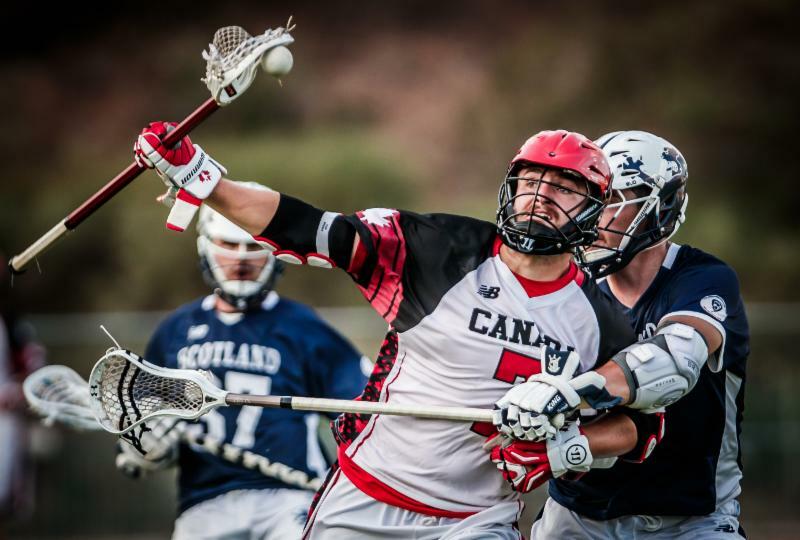 Team Canada moved to 2-0 at the World Field Lacrosse Championships after a 22-3 win over Team Scotland on Saturday in blue group play. Canada dominated the first three quarters of play, building a 17-0 lead. Scotland had a strong fourth, scoring three times as they began to look ahead to an easier test against England on Sunday. Curtis Dickson and Mark Cockerton led Canada with four goals each while Kevin Crowley and Ben McIntosh each had three. Jeff Teat had a goal and seven assists. Dillon Ward made one save in about 30 minutes of action before being rested in favour of Brennan Donville as Canada has a big test against the USA on Sunday. Donville made three saves as Canada outshot the Scots 47-13. Granted, Canada’s talent is objectively a lot stronger than Scotland’s, but the Canadian defense took their opponents seriously. They were strong on faceoffs (Geoff Snider and Jake Withers combined to go 17-27) and held the Scottish forwards to the outside. Eight different Canadian scorers found the back of the net in the first 20 minutes for an 8-0 lead. In the second quarter, Dickson, Crowley, Cockerton and Tre Leclaire all scored their second goals of the game with Ian MacKay and Mark Matthews also tallying. Once it became apparent that the Scots wouldn’t be able to mount much offense, the Canadians used the opportunity to, for lack of a better term, practice their systems. Scotland scored three goals in the final quarter, but whether they had finally settled in or Canada had just let up a little, it was hard to tell. Dickson turned up the heat on the right side and potted two more in the first half of the third quarter. Scotland definitely had more, and longer, possessions in the second half than they had in the first 40 minutes. Their shots became more accurate, with Sean Darroch and James McBride both hitting the post. Goaltender Trevor Jackson made an outstanding save on Jeremy Noble late in the quarter, robbing him of a point-blank opportunity with a stick save in front of the net. Luke Laskiewicz scored Scotland’s first goal on a laser-like low-to-high shot after accepting a behind-the-back pass from McBride 33 seconds into the final frame. The Scots scored two more late in the game with Laskiewicz assisting on both of them. First, he sent a cross-crease pass to Colin Uyeki who beat Donville on the left side. Then he threw his own behind-the-back pass to Daniel McQuade who was cutting to the front of the net.